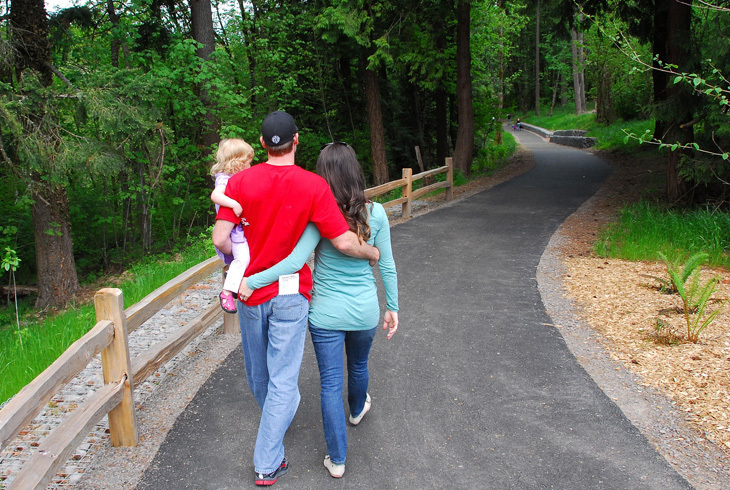 At Jordan Woods Natural Area, bond funding yielded paved and soft surface trails, an overlook, two bridges and a boardwalk. On Nov. 25, 2008, three weeks after the 2008 general election, the Washington County Elections Office certified passage of Parks Bond Measure 34-156. The $100 million measure, THPRD’s first bond measure in 14 years, captured nearly 51 percent of the ballots cast. Its passage has provided funding for land acquisition, facility upgrades, trail expansions, athletic fields, and the preservation of natural areas and wildlife habitats. The bond measure has allowed THPRD to save millions of dollars by purchasing land for future parks, trails and facilities at today's prices. It has also provided strategic improvements by building trails to connect neighborhoods, nature and people, and creating a parks system that will truly serve everyone in the community, for years to come. Through favorable bond sales and refinancing, liability has been cut from $173 million to $142 million over the 20-year payback period. Our strong credit rating contributed to this $31 million in savings, which will pay the bond two years early. Use the links below to track the progress of each bond project, including cost, project summary, master plans, and anticipated completion dates. During the 2008 Bond Measure, THPRD took serious its responsibility to be accountable to taxpayers and patrons. The Parks Bond included requirements for independent citizen oversight and regular audits to ensure that tax dollars are spent effectively and as promised. The board-appointed Parks Bond Citizen Oversight Committee met at least twice annually to ensure that the Park District is meeting bond objectives and using funds as planned. If you have any questions or comments about the committee, please send an e-mail to oversight@thprd.org.